A moving and scientific look at the curative powers - both physical and mental - of rescuing a shelter animal, by the president of Humane Society Silicon Valley. Mutual Rescue profiles the transformational impact that shelter pets have on humans, exploring the emotional, physical, and spiritual gifts that rescued animals provide. It explores through anecdote, observation, and scientific research the complexity and depth of the role that pets play in our lives. 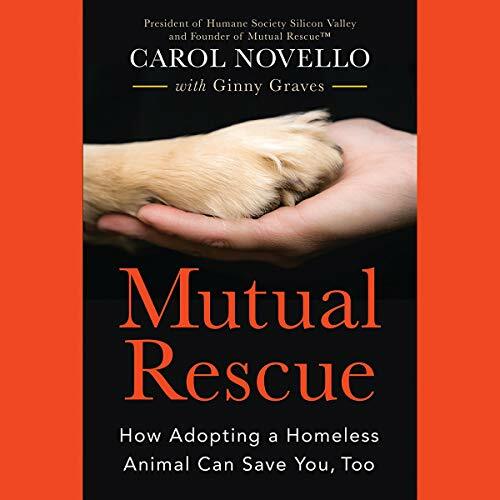 Every story in the audiobook brings an unrecognized benefit of adopting homeless animals to the forefront of the rescue conversation. In a nation plagued by illnesses - 16 million adults suffer from depression, 29 million have diabetes, eight million in any given year have PTSD, and nearly 40 percent are obese - rescue pets can help: 60 percent of doctors said they prescribe pet adoption, and a staggering 97 percent believe that pet ownership provides health benefits. For people in chronic emotional, physical, or spiritual pain, adopting an animal can transform, and even save, their lives. Each story in the audiobook takes a deep dive into one potent aspect of animal adoption, told through the lens of people's personal experiences with their rescued pets and the science that backs up the results. This audiobook will resonate with listeners hungering for stories of healing and redemption. Empathy is a muscle; the more you start using it, the stronger it gets—and your mind opens along with it. All of a sudden, that beloved furry companion becomes more than a source of occasional affection, amusement, and constant upkeep. Rather, you start to see, bit by bit, into the emotions that slip under the radar of casual observation. When your pet rabbit hops over to you and licks your face during a nervous breakdown; when your dog barks madly at passerby when your uncle was having a stroke until someone came to help; when your hamster's insatiable curiosity and endless drive shows you new and profound ways to approach life's problems. This book represents all of these things, and more. Highly recommended.